My birthday is right around the corner (less than a moth away!) and that has me thinking about how even though I'm in my twenties, I still don't really feel like an adult and I'm not sure why. Maybe it's because I'm still kind of new at this and horribly unprepared. Let's dive a little deeper into this, shall we? I don't own throw pillows - Honestly I don't see a purpose for these. Like... I'm gonna put them on my bed or couch and then when I want to lay or sit... they go right on the floor! These are pillows with literally NO purpose except to look nice. I'm not ready for that kind of responsibility. I don't go to happy hour after work - I'm a nanny, so often times "happy hour" is long over by the time I get off work. I feel like having a 9-to-5 is a crucial part of general adulthood (though tons of real adults rock other working hours, obviously) but since I don't have that Monday-Friday "daily grind" I don't get to be "adult enough" to hang out at Chili's at 5pm in my work clothes. Also... my work clothes are yoga pants. My towels don't match - I have tons of bath towels in multiple different colors. Some of them are actually beach towels that I use as regular towels. I have no use for hand towels, as I can grab one of my randomly strewn-about towels or even dry my wet hands on the yoga pants I wear to work. Neither do my dishes - I don't have a matching set of bone china from France, partly because I have not made a wedding registry, and mostly because I don't think I'll ever want bone china from France. I wouldn't mind having a matching set of tableware, but if and when I do, they'll likely come from Target. My "life savings" is just the money left over from my paycheck each week, if there is any. That European vacation ain't gonna happen any time soon, even though I wish it would. I've never rented a car or flown on a plane by myself. That will change very soon, but as of this exact moment, these are two adult things I have avoided at all costs. I don't really have a 5 year plan... except I know I want to get a "big girl job" soon after graduation. After that, there is no real plan. I expect life will continue to happen to me, and I'll go from there. I've never hosted a dinner party - Dinner parties just sound really expensive and so much work. Entertain yourselves people! You can come over, I have Netflix and wine, and wine is practically a fruit plate, right? By that logic, pizza is a salad. We're eating healthy! I don't find errands "relaxing." Occasionally I hear people (especially moms) saying that they had a nice peaceful day going to the grocery store, dropping things off at the post office, and hanging out at the DMV. How is this a thing? I'm definitely not ready to have kids if escaping to the DMV sounds like a treat. No way. I like too many "kid" things - Yes, I know you can like kid things as an adult, but how many adults regularly hang out in onesie pajamas eating Lucky Charms and watching The Little Mermaid? Not many, I would guess. If you are that kind of adult, hit me up. I want to be your friend. I have coloring books. If not, do you relate to any of these things? This was so funny. I have some throw pillows on my bed in my uni room because I find them to make my room more homey but I never sleep with them in my bed! I freaked out when I turned 23. I felt like 22 was a young adult, but 23 made you and adult adult and I was NOT ready to adult. While I do a lot of the things you mentioned (my towels and dishes match, I go to happy hours, and I have flown on a plane alone) I am still a kid at heart. No matter how much adulting I do, I will never turn down watching The Little Mermaid, going to Disney World, or jumping on a trampoline. P.S. Errands will never be relaxing, those people are cray cray! Can we hang out please, Jess? I'm currently sitting with a chocolate lollipop and dinosaur masks next to my laptop (I was at an adults only party at the zoo on Friday), drinking tea out of a Cinderella mug, which is next to a case of DVDs I have specifically for my Disney collection. I also have a colouring book - and it's fairytale themed. I turned 26 earlier this year and I still feel like I'm "playing" at being an adult, like I might get found out as a kid with a bank account soon. Aww man, I actually do a lot of these :/ Except I definitely don't find running errands relaxing because I'm socially awkward and can't function in public. Haha. Fun post! I don't have matching towels either, most of my towels are gifts, so why spend money to buy matching ones? I have what would probably be called throw pillows, but one of them was made by my grandmother, and the other is a cool quilted pillow, and I love quilted things. I don't have a 5-year plan either, and I'm in my early 30's. My life savings consist more of old coins I've collected. I guess you could say in theory I hosted a "dinner party" I had one for my birthday a few years ago, but it wasn't that glamorous, my friends brought the wine (even though I asked them not to, because I rarely drink), the food was not very special either, and afterward I opened my presents and my friends and I just hung out and chatted. 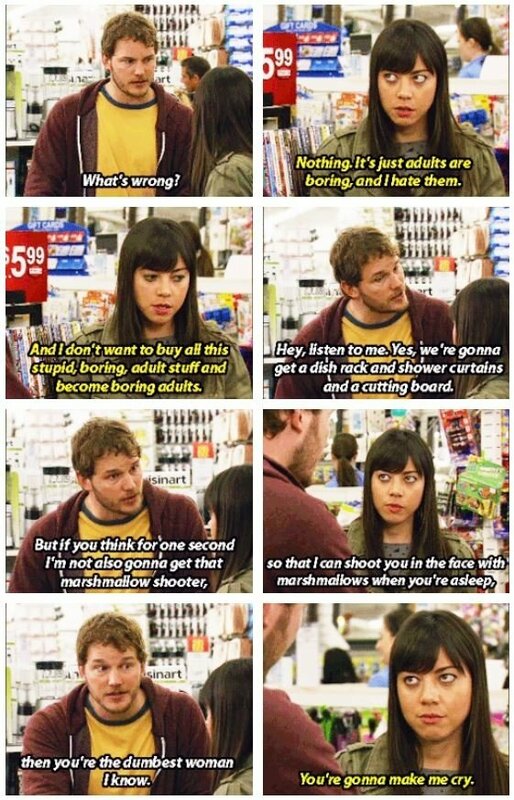 I like to do kid things too, I would totally come and hang out with you. I have a few kid movies and I love dot-to-dot books. Sometimes I feel too much like an adult, but that's just stuff in life I have to deal with. Bloggin' Babes // Victoria from Treelined Avenue!